As a band that has traditionally built their scrappily spirited albums layer by layer in the undisturbed seclusion of their Philadelphia studio, Dr. Dog realized they would need to leave these comforts and work in a professional studio with the help of an outside engineer and producer if they were to continue their album-by-album growth. Having evolved from a band whose primary creative outlet was the album-making process into one that increasingly favored the energy of their live performances, they knew they wanted to document the new dynamic they had developed on the road. In Rob Schnapf (Beck, Elliott Smith) they found a producer who had earned his reputation making albums in much the same fashion as Dr. Dog had, eventually moving on to the bigger and better sounds that they now wanted. With his help, the intricate arrangements of Fate were peeled back to reveal the raw immediacy of a tight five-man unit honing their craft. During these sessions at Dreamland Studios in West Hurley, New York, their unkempt edges were pruned, producing lean and muscular arrangements they could perform live without having to translate violin lines into guitar solos or vice versa. Along the way, what could have been merely a live-in-the-studio detour became nothing less than the culmination and unification of everything theyd done to that point. Founded on a creative relationship whose roots stretch back to when McMicken and bassist Toby Leaman met in the 8th grade, Dr. Dog was years in the making. After long hours practicing in basements, performing in barns, and tweaking knobs on cassette four track machines, Dr. Dog was officially established in 1999 with the Psychedelic Swamp record. What followed was an intense period of stockpiling eight-track recordings, open-ended enrollment policies where Dr. Dog membership included a man who played a one-string guitar in a skintight skeleton costume and another who danced in the crowd while wearing a tuxedo. 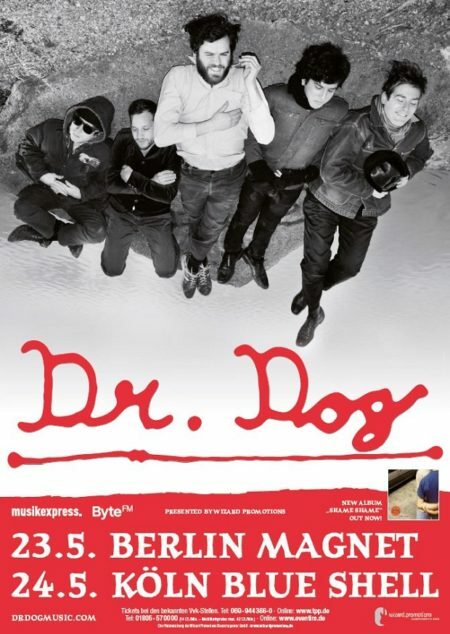 Despite their loyal hometown following, Dr. Dog could have very well remained a Philadelphia phenomenon had McMickens then-girlfriend not slipped a copy of Toothbrush, a collection of home recordings, to Jim James of My Morning Jacket, who would take them on their first tour and prepare the way for the waves of positive press that would greet 2005s Easy Beat. By 2007, their next album We All Belong was earning the band opening slots for Wilco and the Raconteurs and they were turning up all over late night television. They upped the ante with their sonically ambitious Fate and started headlining their own tours. By the spring of 2009, the treadmill had run them ragged, and their new songs reflected a life spent with the nagging realization that things were out of a balance. Dr. Dog has created a song cycle of doubt and despair, bookended with the woozily swirling harmonies of Leamans lonely opener Stranger and the harsh self-critique of the title track, a gnarled admission that sometimes its best to admit your mistakes and move on. Their most openly autobiographical release, ranging from McMickens exploration of West Philly underlife in Shadow People to his account of two soul-bearing late night conversations in Jackie Wants a Black Eye, its an album whose dark themes are soothed by bright harmonies, taut guitar riffs, and soaring melodies. Past stylistic references remain, but the tone is entirely different, with doubt, confusion and unanswered questions. And yet Shame, Shame is not a joyless affair Just like each of their previous albums, its record destined to claim its place on the timeless margins, untouched by modern tastes and content to exist on its own terms. Dig deeper, and youll see that its the sound of bones groaning to support new growth and the story of how just how difficult the maturation process is, even when you want it more than anything. Its the sound of Dr. Dog writing their next chapter, the one theyve been working towards since they played their first notes together.